Residing in the bustling The Lanes area of the city, the doors to Gars restaurant have been open since 1983; their reputation now resolutely allied with some of the best Chinese food that Brighton has to offer. So much so that when someone says they’re off out to Gars, rarely does anything more need to be added. Everyone knows Gars. 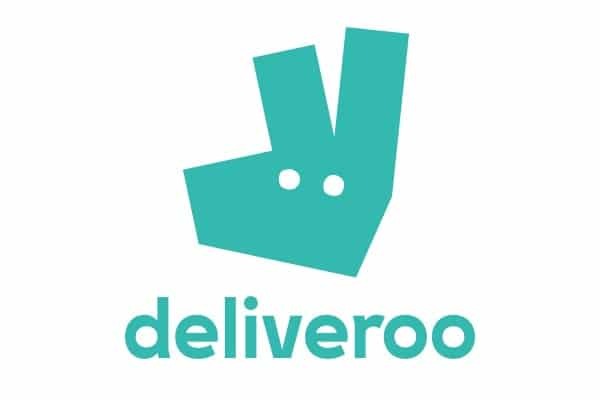 What you might not know is that you can now enjoy their food from the comfort of your own home as they’ve teamed up with gourmet takeaway specialists Deliveroo. On this occasion, with our food scheduled to arrive at 8.30pm, I actually received a phone call from Deliveroo at twenty past. There was a friendly voice on the line informing me that the delivery was going to be 5 minutes late followed by an apology. It might only be 5 minutes but I thought the call was apt and well considered. As it happens the food turned up at 8.32pm, piping hot too. The Gars menu is extensive and also features snippets of other Asian cuisines too; for practical reasons the ‘takeaway’ menu featuring on the Deliveroo site is marginally pared down, though still offers plenty of choice. Alongside some prawn crackers we’d chosen appetizers of Vietnamese spring rolls and grilled pork dumplings accompanied by a particularly feisty sweet and sour chilli sauce, which tasted alone was good enough to savour. The generously sized spring rolls housed an aromatic filling of fine cut Chinese vegetables and rice noodles, enclosed in lightly fried rice papers. 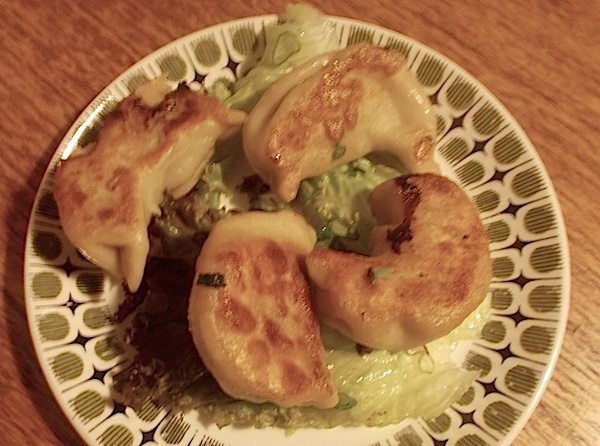 Likewise the dumplings were more than ample, the pork filling well-seasoned and served with dark soy. 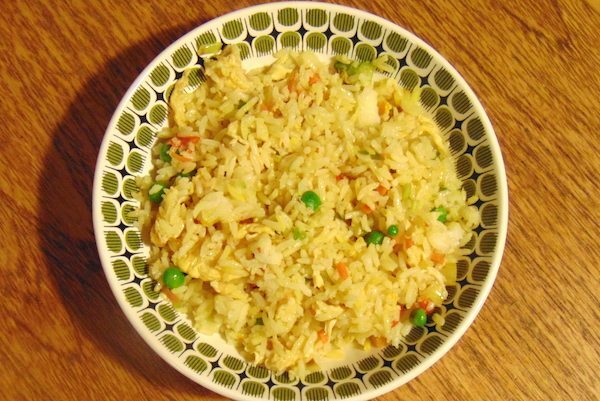 The ‘Gars’ rice dish featured egg, peas, pepper and spring onions; it was cooked and seasoned well as one would expect. It was a tasty steadfast dish playing support to some more exuberant mains. Speaking of which, my dining pal had opted for Peking style chicken with garlic, wine and ginger. 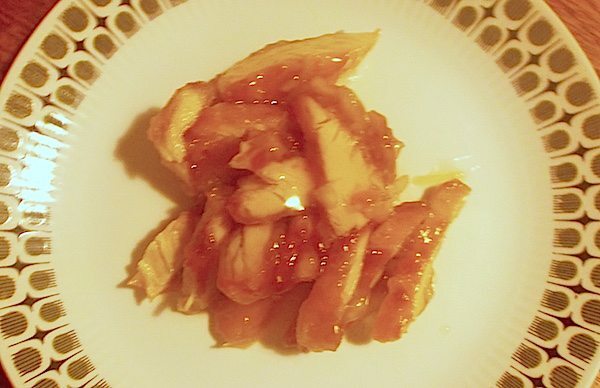 The chicken was moist, tender with nice colourization to its crisp edges. Sitting in a gelatinized sauce, the contrast of the two textures was interesting and worked well, while the combination of garlic, ginger and wine was intensely aromatic. The wine offered a sweet acidity next to the more medicinal ginger. Out of all the dishes the Char Siu, (meaning ‘fork roasted’) was probably the star turn. Super tender pieces of slow roasted pork in a rich meaty broth served on choi sum leaves were delicious. Having said that, a special mention must be extended to the upfront flavours of the other accompanying dish, vegetable Singapore noodles, some of the best we’ve had. Amongst crisp slithers of celery and pepper, well-browned onions and spicy curry powder combined to forge a bold and almost BBQ like quality. Price wise the meal clocked in just under £10 more than a normal takeaway of this nature, but then it’s worth remembering that Gars is one of the cities most eminent eateries. With that perspective on board and with the food coming restaurant hot to your home the whole package comes highly recommended.